Leadbeater is the author of the book, We Think, about the impact of social media-driven mass innovation. "There's a general awareness now that the Net isn't simply a decoration on contemporary society. It's a challenge to it. A society that has an Internet is a different kind of society than one that doesn't, much like a society with a printing press was very different than the one without it. Unlike all of the media revolutions in human history, though—the printing press, the telegraph, moving images and sound, and finally the ability to harness broadcast—the Internet creates groups. It moves us into a world of two-way groups. Group action in society just got easier. This is a big deal. Freedom of speech, assembly and religion are all now the same freedom. 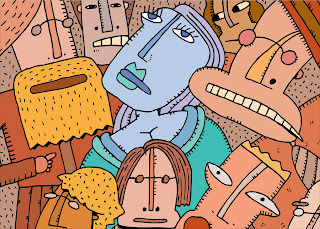 We are living now through the largest increase of human expressive capability in history." The significance for nonprofits and other advocacy groups? "A big part of the traditional organization is going to be comprised now of people you have to convince rather than command," Shirky told Cause Global. "Where the organization is headed will be set partly by management and partly by the members, and it's something employers will have to learn to live with." For more big thoughts—the top 10 trends stemming from social media shared at PICNIC this year—click here. "...Two huge teams are in a massive public brawl in an era in which the Internet has liberated everyone in the country from the old restrictions, the old establishment, the old, encrusted media monopoly. YouTube has yielded, this year, the most moving and wittiest advertisements about each of the candidates. 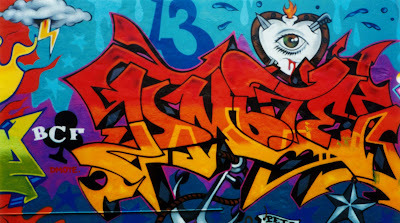 Professional political consultants with their piece of the buy didn't produce them, artists did. For Obama, it was the video by will.i.am, with the Obama speech and the snatches of song made from his words. More than anything else this year, [this Obama video] captured the feeling behind his movement. The McCain video, alas, was anti-McCain, and keyed off the will.i.am video. It featured young people and artists taking snatches of McCain speeches, turning them into song, and then starting to...freak out as they listened to the words. It made you laugh out loud. Anyway, one of the untold stories of the year is the failure of the political professionals to compete with the art and brightness of the nonprofessionals..."
The Clinton Global Initiative ended today, unbowed by the U.S. economic crisis. Top attendees — which included some 45 global CEOs, 60 heads of state, scores of advocacy leaders, and even a few Hollywood entertainers—ended up pledging close to $8 billion for new projects that would improve the lives of some 158 million people around the world. * British Prime Minister Gordon Brown spoke for a full 25 minutes (extemporaneously, without a teleprompter or cue cards), urging the construction of a "global civic society" and the increased use of the Internet and social media to fight for human rights. He also called on those assembled to innovate their 20th-century institutions such as the World Bank and the United Nations to better tackle modern-day challenges of climate change, poverty, and global health and education gaps. Click here to see Clinton's introduction of Brown, followed by Brown's full remarks. * Social media for social change got another nod at CGI when CGAP (Consultative Group to Assist the Poorest, an initiative of the World Bank Group) pledged $10 million to create a mobile banking system for some 25 million people in 20 countries. CGAP CEO Elizabeth Littlefield called it a "mobile banking call to action." She said: "Millions of poor have been left out of the formal financial system; the brick-and-mortar branch bank system can only go so far." With cellphone service and a local shop handling the cash, she said, "mobile banking can reach every village and barrio in the developing world." Target countries include: Afghanistan, Bangladesh, Brazil, Ecuador, Egypt, Ghana, India, Kenya, Mexico, South Africa, and Uganda. *Rene Preval, President of the Republic of Haiti, issued a moving, eloquent appeal for fast help rebuilding his flooded nation, ravaged in late August by Hurricane Gustav. "It's sad to say that if there are no dead bodies on the [TV/computer] screen, public opinion becomes disinterested very quickly," he said. "Important work remains to be done." Haiti's infrastructure needs to be completely rebuilt—but not, he said, so it resembles what it was before. "We need to build back better," he said—to better withstand what is certain to be more hurricane activity in the region in coming years due to the affects of global warming. "More than 90 percent of the crops in Haiti have disappeared in this recent string of hurricanes," Preval told a panel on poverty, "and in six months, we will not have any food to give to the population." Fellow CGI attendees Matt Damon and former Canadian Ambassador Frank McKenna (chairman of the nonprofit ONEXONE.org); Wyclef Jean of Yele Haiti, and past CGI attendees Angelina Jolie and Brad Pitt were among those who pledged more aid to Haiti today. More is needed, Bill Clinton said. "There is a misperception of assets and opportunities in the world and a misalignment of how we invest our time and money and (build) the kind of future we all say we want," Clinton said in closing remarks. "We need to close the gaps between what we feel and what we see, and between what we say and what we do." The first CGI-Asia meeting will be held in Hong Kong December 2-3 and a "youth CGI" will be held at the University of Texas at Austin in February. Bill Clinton's fourth annual, star-studded thinkfest on philanthropy, technology, and cause advocacy—the Clinton Global Initiative—kicked off today in Manhattan with a bang of urgency. It's the third CGI I've attended; this year's conference is rife with references to global climate change, the U.S. financial meltdown, and the need for the next president, whoever he will be, to restore some of America's standing in the world. 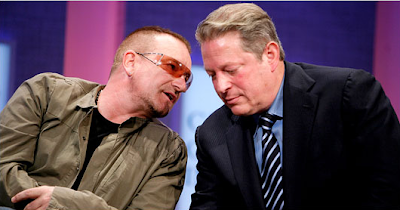 *Bono blasted the failure of the developing world to make progress meeting United Nations Millennium Goals. He also blasted the Wall Street bail-out, saying: "It's extraordinary to me that you can find $700 billion to save Wall Street and the entire G-8 can't find $25 billion to save the 25,000 children who die from preventable diseases and hunger." Bono, flanked on an opening session stage by Al Gore, Lance Armstrong, Bill Clinton, Queen Rania of Jordan, and Liberia President Ellen Johnson-Sirleaf, said: "Bankruptcy is bad enough but this is moral bankruptcy." The lead singer for U-2 and cofounder of Product (RED) also said the next U.S. president should lead a global effort to tackle climate change, poverty, and other global social ills. 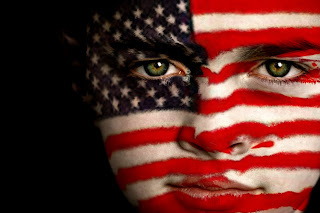 This, he said, would "help America to re-describe itself to the rest of the world." *Al Gore urged young people to engage in "civil disobedience" to stop the creation of new coal-burning power plants. The Nobel Peace Prize winner and environmental crusader said that since last year's Clinton summit, "the world has lost ground to the climate crisis. This is a rout. We are losing badly." Gore called on young people to step up and take action. "If you're a young person looking at what is being done right now, and not done, I believe we have reached the stage where it is time for civil disobedience to prevent the construction of new coal plants that do not have carbon capture and sequestration." Gore said there are about 28 coal plants under construction in the United States, with another 20 projects near the start of construction. Gore also called on people to stop "buying the lie, the notion" that burning coal is still an acceptable energy alternative. "There is no such thing as clean coal," he said. "Clean coal is like healthy cigarettes. It doesn't exist." *Bill Gates, in an on-stage, one-on-one with Bill Clinton, said that amid the financial crisis and economic slowdown, "we have to show [the wealthy] that [philanthropy] is fun, that it has impact, that there are great success stories." When asked what advice he'd give to wealthy philanthropists now taking a beating on the value of their investments, Gates said: "I think there a lot of rich people. The percentage [of their wealth] that is being given to these great causes and inequity relative to that wealth is very small, and so a fairly modest increase in the amount [of giving] going [to philanthropy] can certainly offset the gyrations in terms of stock market valuation." Click here for the video of the "two Bills" conversing at CGI. *Bill Clinton told a small group of bloggers that he thinks there is, at least, "a 50 percent chance" that people will give more to those in need during the evolving U.S. financial crisis. He said the meltdown "will make the work of putting philanthropists and organizations together more significant over the next couple of years." *Former U.S. Treasury Secretary Robert Rubin, a panelist on an anti-poverty panel, called the current U.S. financial crisis "a really extraordinary situation—by far the most extraordinary situation the capital markets have faced since the 1930s." Rubin, currently the director and chairman of the executive committee of Citigroup, said the first priority for the country is to "deal with the crisis of confidence that we're facing." He recommended quick passage of "some version" of the bailout plan now before Congress, saying that "there are no guarantees in life, but what is being proposed could help significantly, and if it's not passed, then it will exacerbate" the crisis. *Former President George Bush (41st) made a surprise appearance to talk about the need for Americans to join him and Clinton to raise money for families displaced by natural disasters in the American South. "People are without homes and without jobs as a result of forces beyond their control," Bush said. "Just as we Americans gave to the victims of the tsunami four eyars ago, we must give to those in the Gulf suffering from sudden displacement." The conference continues through Friday. Given the week's financial meltdown on Wall Street, all four panelists acknowledged new levels of skittishness among advocacy groups heading into their annual giving season. Many attendees predicted the worst giving season since 9/11. "If you doubted it before," Bhagat said, "engaging supporters (using social media) is now mandatory." Added McHale, founder of Good2Gether, a Boston-based Web service that helps nonprofits promote their work by placing widgets next to online news stories relevant to their cause: "The word out there (among nonprofits) is terror." Organizations that have not previously taken big strides with technology, he said, are being forced now to play catch-up—fast—and not all groups will make it. "This economy is really focusing people on finding new ways to get to more people, faster," he said. But Bernstein, manager of information systems for the Brooklyn Museum, cautioned that marketing shouldn't be the sole focus of the Web's new social engagement tools. "It’s really important that people participate in a cause, and feel like they've had some input," she said. 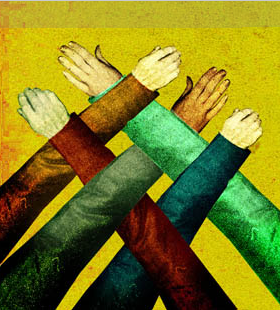 "That must come first...If people feel personally engaged and part of (your cause), they will contribute. But first and foremost, this is about engagement, not marketing. It's a critical distinction to understand. If you're not personally more engaged with your supporters using these tools in authentic, sustainable ways, they'll go somewhere else." To be sure, the rise of social media will trigger structural changes at many nonprofit organizations, panelists agreed. "Organizations as we knew them are dead," said Verclas, co-founder of MobileActive.org, when asked to come up with a quick phrase summarizing the impact of this so-called Web 2.0 on philanthropy. Elaborating, Verclas said social media are so powerfully reshaping the way people organize themselves into groups for change, that not only do nonprofits need to manage donors differently—they also must rethink the way they manage themselves. For more on the push by some nonprofits to use crowdsourcing and other forms of social engagement to boost support in this flagging economy, see my story on MSNBC.com, the first in a series I'm producing to explore the rise of social media and their influence on the nonprofit sector during the current economic downturn. One final note: Worries about the future of philanthropy similarly dominated the conversation at a private book party hosted tonight by Economist North America Publisher Paul Rossi to celebrate the September 30 release of U.S. Editor Matthew Bishop's new book about America's new class of philanthropic billionaires, Philanthrocapitalism: How the Rich Can Save the World. Co-authored by Michael Green, the book describes how these wealth titans are reshaping philanthropy, using big-business-style strategies and expecting results and accountability to match. Do these new giving powerhouses like Bill Gates, Bill Clinton, George Soros and others have too much power? Who holds them accountable, Bishop and Green ask—and, perhaps most urgently, will these leaders continue to give generously through the financial sector's meltdown? Bishop, for his part, told guests assembled at The Campbell Apartment in Grand Central Station that the new climate on Wall Street will put the much-professed commitment of these new philanthrocapitalists to its first real test. "We'll know soon enough if this was just a hobby born of a company's or an individual's desire to burnish an image or whether today's activism represents the deep commitment to change that has been expressed these past years," Bishop said. Either way, Bishop added, "the rich will probably get richer, regardless"—and philanthropy, ever-more critical. Said Green: "The huge cost of bailing out the financial system will mean that the government will have far less to spend on everything else." As if to emphasize that point, next door to the Harvard Club—where Bishop and I addressed side-by-side panels earlier in the day—someone put a sign made out of masking tape on the cornerstone of the old New York Trust building. Just beneath the chiseled granite that heralded the bank's founding in the late 1800s, the sign added the postscript: "Floundered, 2008." There's a guy at IBM's Collaborative User Experience research group, a senior software engineer named Jonathan Feinberg, who creates what are called "wordles"—word pictures that map the frequency of words used in a speech or, say, a nonprofit mission statement. Feinberg's idea is simple: the more frequently a word occurs, the bigger it appears. Will wordles change the world? Hardly. But don't underestimate their power to clarify a message or spot a good (or bad) mission statement in a heartbeat. 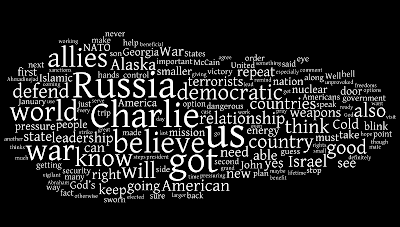 Consider the wordle, above, of vice presidential candidate Sarah Palin's recently televised interview with Charles Gibson of ABC, which includes her assertion that she "knows Russia" because it is so close in proximity to her home state of Alaska. Below, take a look at a wordle of Barack Obama's acceptance speech at last month's Democratic convention in Denver. 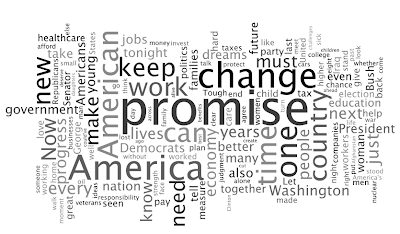 Change is big—literally (as measured by word size here)—but not as big as the word "promise." But even wordles can't (as both Obama and John McCain have said this election season) "put lipstick on a pig." See below. It's a wordle of the mission statement for a dot-org called VBAC, a home-birth advocacy group based in the United Kingdom. The message here? A muddy mission statement is—in any form—incomprehensible.